I met Abbey Holden on the first day of fourth grade, and even then, I knew there was something special about her. She’s gorgeous, kind, personable, and, as evidenced by the pics below, uber talented. 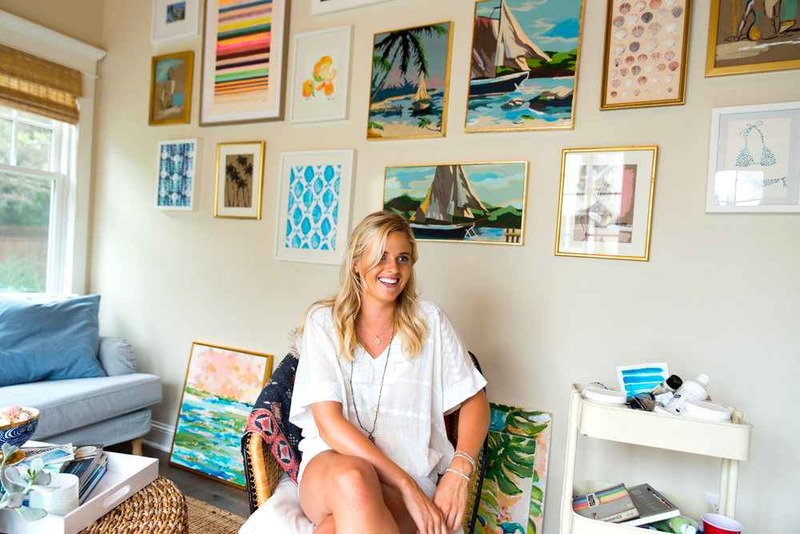 Even as a kid, Abbey had a clear gift for art, so it should come as no surprise to learn that she studied it further in college and became a print designer for Lilly Pulitzer (!!!) after graduating. 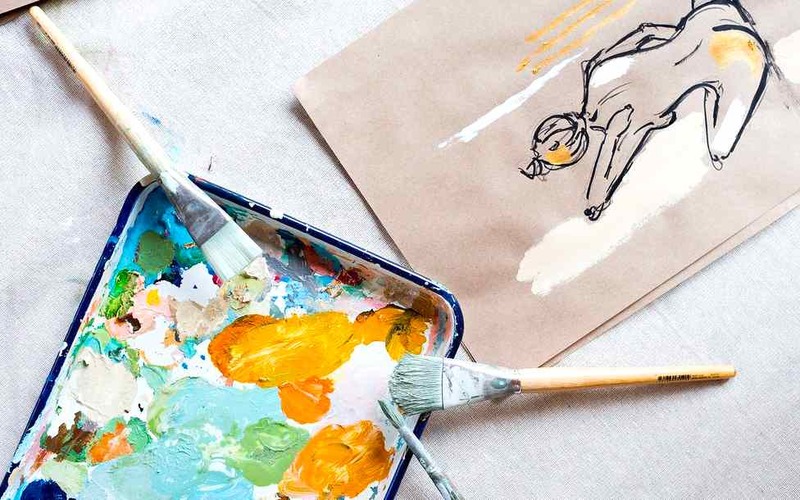 Her most recent endeavor, though, has been starting Abbey Holden Studio, which sells the absolute dreamiest paintings on the planet. Check out our Q&A with Abbey to learn more about her paintings, what it’s like to be an artist, and how she started her own business! I have! In fact, I was recently sorting through old keepsakes and found homework from 3rd grade in which I wrote, "I want to be a painter when I grow up." My Grandmother was an incredible painter and I grew up watching her work, always in awe of her. My parents paid attention to my love for creating and intentionally signed me up for many extra-curricular art classes. From then on, I focused my studies on art and eventually landed a job working as a textile designer full time! How would you define your artistic style, and how did you develop it? My style is always changing but there are some consistencies. I tend to look towards Impressionists painters for inspiration and try to incorporate a painterly style and colorful layout in every work. Currently, I'm on a blue kick and have found myself using all shades of blue in every work. Something about that color is so impressive to me. What has it been like starting your own business? Starting my own business has been a wonderful learning experience. It took a lot of encouragement from family and friends to make the initial leap, but has been the best thing I've done. Currently I'm learning to not get caught up in the minor details required to run a business and to not lose sight of the reason why I'm doing this! There are some days filled with doubt and others with great inspiration, but that's part of being your own boss. As long as I'm progressing towards my goals, I'm happy! Typical day in the life? My days are all very different, but some parts remain the same. I wake up early, meditate and pray right away, then write down a prayer that fits the theme of my day along with my goals for that week. This time is so restoring and important for me. After that, I usually workout and head to the studio for the rest of the day! I'm usually painting until the evening with a good audiobook or show on for entertainment. Painting and creating has always had this amazing connection to my heart. There are few things that continually inspire and impress me like art does. It's pure love. Being able to share this part of me with others is so rewarding. You’re a spin instructor, too? What’s your diet and fitness regimen like? Yes, I am! I have always been the kid who loves broccoli and someone who can’t sit still for long, so exercising is a part of my daily routine. As far as diet goes, I try (emphasis on try...) to eat as clean as possible and get protein in with every meal. In terms of exercise, I spin anywhere from 2-5 times a week, run, and practice yoga almost every day. Of course, there are days I don't do anything - but exercise is a very meditative and calming routine for me. Matthew 5:16 is a great daily reminder. "In the same way, let your light shine before others, that they may see your good deeds and glorify your Father in Heaven."